Poker in the Park, Europe’s biggest poker festival will return to London on 2nd and 3rd September 2011 at the new venue of Hanover Square, a stone’s throw from Oxford Circus. Last year 20,000 poker fans flocked to Leicester Square to celebrate all things poker and rub shoulders with the likes of Liv Boeree, Devilfish, Neil Channing and Evander Holyfield. The Gamblogger couldn't make it last year but is looking forward to seeing you there this September! As well as live Sit n’ Go’s running around the clock, visitors can expect free strategy lectures from some of the world’s top players, live tuition, autograph signings and photos, heads-up tournaments on cutting edge electronic poker tables, cut price deals on the latest books and merchandise, surprise celebrity guests and more. This year the organisers say the event will be even bigger, with more marquees, two giant poker domes, activities and more big name brands. For the first time ever, there will be a Main Stage, with acts to be confirmed soon. The Main Stage will also host the second annual British Poker Awards, a ceremony to honour the cream of British poker, in a year when UK players continued to dominate on the international stage. Visit www.pokerinthepark.com for more details. 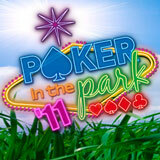 Were you at Poker in the Park last year? Use the Comments box below to tell us about it!